5k NOW STARTS AT 7:30 am -- due to heat warnings, we've moved the 5k start earlier in the morning! Heat Wave Leads to Earlier Start for 5k! Hello runners and walkers! There are a lot of moving pieces for this event and we want you to know everything you need to know. Please take a moment to read through the material that we are providing so that you know what to do and when to do it. Below are all the details on the race schedule, parking, what to do with your bib number, awards, race course details, and more. Way below are also maps of the race course and maps of the staging area. 1) Change of 5k race start time to 7:30 AM. We've been monitoring the weather and we're worried about this weekend's heat wave adversely affecting runners and walkers. 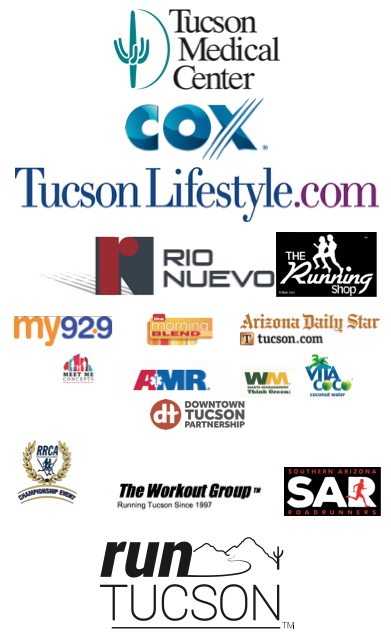 In consultation with the Tucson Police Department, we have changed the start time of the Tucson Lifestyle 5k to 7:30 am. 5k Hydration: There will be a water station just after the 1.5 mile mark staffed by the Sam Hughes Huskies elementary school cross country team and parents, but if you will be walking we encourage you to bring your own water or hydration beverage. There will be water and Gatorade at the Start/Finish. If you will take more than three hours to complete the half-marathon, we encourage you to start at 5:45. Check in for the early start is at the starting line at Church and Pennington at 5:30. To make it easier on race logistics, please email the race timer at greg@roadrunnerracetiming.com if you want to start in the early wave. If you want to move from the Half-Marathon to the 5k, please email the race timer at greg@roadrunnerracetiming.com so that we can enter your data. if you decide to change at the last minute, simply skip the half-marathon and do the 5k -- but please note that there might be timing glitches if you do not let the timing staff know. PLEASE NOTE THAT THERE ARE NO RACE TRANSFERS OR BIB SWAPPING AT THIS POINT! 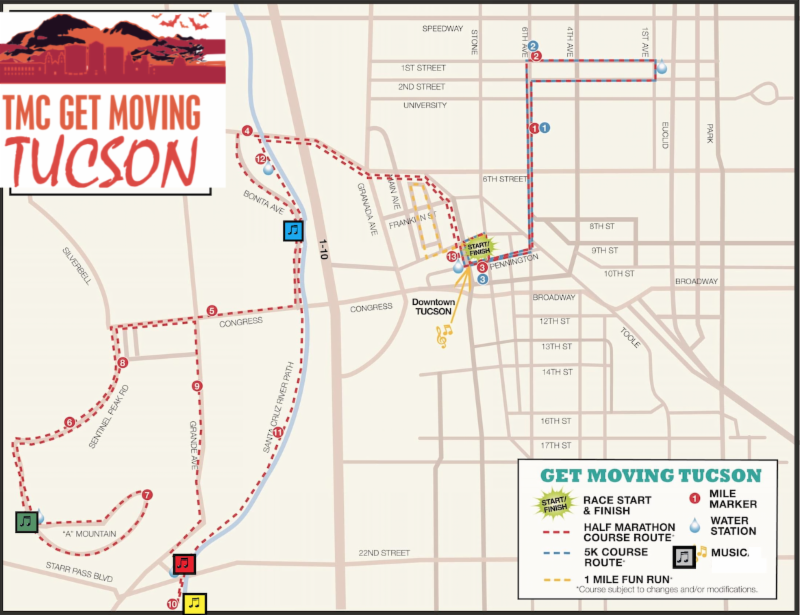 In consultation with Tucson Police Department and AMR ambulance company, we will be monitoring race morning conditions and adhere closely to the 10:30 am half-marathon course closure deadline. If you will be longer than that time, please start in the early wave at 5:45. Half-Marathon Hydration: We will have water at Mile 3, Mile 4.5, Mile 6.5, Mile 7.5, Mile 9.5, and Mile 12. We will have Gatorade at Mile 6.5 and Mile 7.5, and again at Mile 12. If you will take longer than two hours, we advise that you consider bringing additional hydrating beverages with you, including sports drinks or beverages with electrolytes. Except for the 32 people who have signed up for the Virtual Race (that does NOT include those who want to sleep in after Homecoming! ), you must finish the race to receive your finisher's medallion. 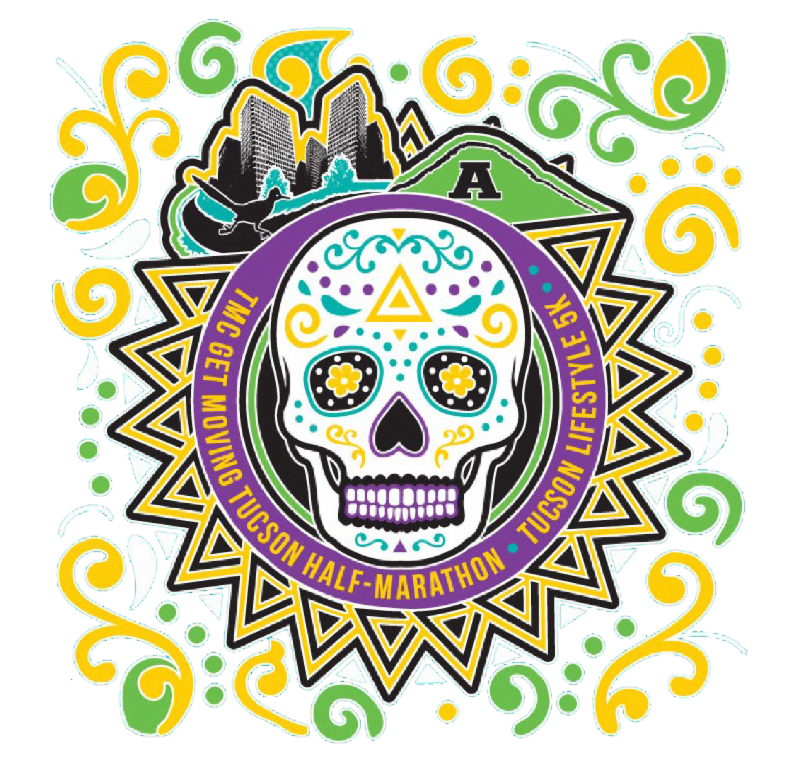 We have extended the cap to allow late registrants to enter -- those who signed up after 10/22 at 9:00 am have received notification that they will have "No Shirt No Medal" printed on the tag of their bib number and will not be able to pick up a shirt or finisher's medal until after the last finisher has crossed the line. 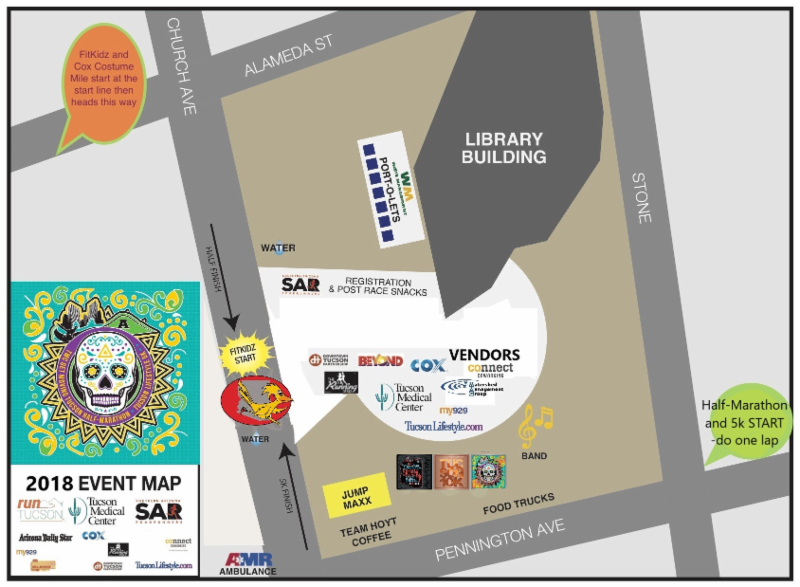 Race beneficiary Presidio San Agustin del Tucson is offering free museum entrance to all race participants and guests from 9:00 am - noon on race day . Visit the historic Tucson Presidio, which is (literally) just steps from the finish line (go north on Church, turn left on Washington and you're there). T hanks to your entry fees plus help from TMC, Cox Communications, and Rio Nuevo, the TMC Get Moving Tucson events raise funds for local organizations, including Watershed Management who will be managing a water and Gatorade aid station on the course), and Team Hoyt Arizona (who will hand out free coffee from their Team Hoyt trailer! ), and the Southern Arizona Roadrunners , who are helping with all sorts of race details. And of course, the BEYOND-Tucson Foundation will receive almost $10,000 as part of the Gabe Zimmerman Triple Crown! Volunteers: We can manage with the friends we have, but if you know anyone who wants to help out before or after the race, we're happy to take a helping hand. If you know anyone else who wants to hand out water or gatorade or help hand out medals at the finish line (or even be our lead bike rider for men and women) we'd love to hear from them. They can write Tia at tia@runtucson.net. Unless you are one of the 32 people have signed up for the Virtual Triple Crown, you must finish the race on race day to get your finisher's medallion. We'll send out additional updates, but remember that you can always go to the SAR website at www.azroadrunners.org for updates. You can check to see if your registration is accurate in two places: at the SAR site or on our race registration page . 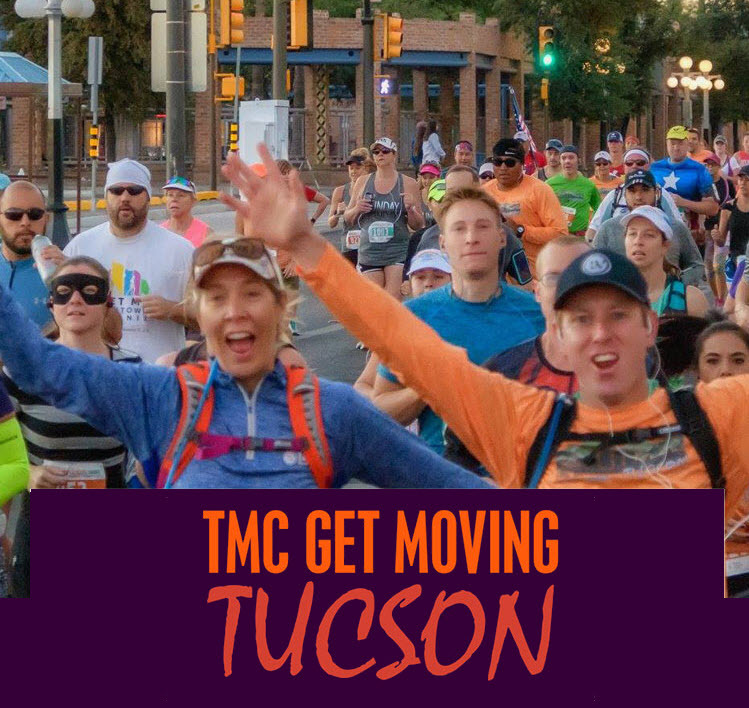 If you want to change your race distance, please send me an email by Wednesday October 24th at midnight and we'll get you squared away ( randy@runtucson.net ). OK -- now below are maps and even more specific details. See you this weekend!! YES: it will be crowded, so please be nice to the volunteers and the staff at The Running Shop. YES: there is race day registration, but we are not promising shirts and finisher medals to anybody who signs up late. * If you think it will take you more than 3 hours to do the half-marathon, we ask that you do the early start. Sunday is due to be especially hot and we want you to be safe as well as help the ambulance units, police, and volunteers who are tasked with making sure you stay safe. * To make it easier on race logistics, please email the race timer at greg@roadrunnerracetiming.com if you want to start in the early wave. 7:30 am Official Tucson Lifestyle 5k Run/Walk Start . NEW TIME! There will be Gatorade, water, Neuro Sports Drink, and VitaCoconut Water at the Start/Finish. This course stays the same as always, with one lap of the staging area, then the loop around West University. It is measured, but not certified. 5k Hydration: There will be a water station just after the 1.5 mile mark staffed by the Sam Hughes Huskies elementary school cross country team and parents, but if you will be walking we encourage you to bring your own water or hydration beverage.